Image is from 1978 Invasion Of The Body Snatchers, thanks Moondog. But the subject at hand is: Things we’ve invented which will eventually kill us all. I’m not talking about boring things like high fructose corn syrup; I am just as angry as you when a nature show purports to list the 10 Somethingest Somethings and inevitably gives the number 1 spot to an insect or microbe instead of something cool like a dinosaur. No fakeouts here, just earnest warnings. Researchers at UCSD have developed a giant robot baby with an even more giant robot baby head capable of expressing realistic emotions and frightening everyone except the brainwashed drones who work in their lab. Click the photo for the story. Have any horrible abominations of your own? Well for heaven’s sake don’t share them. I’ve got enough to cope with here. But I’ll welcome comments. This entry was posted in baby, cyberdyne, giant head, robot, skynet, unholy. Bookmark the permalink. Here's a machine to soothe the savage breast. Unfortunately it is only in the animation stage. Perhaps a good weekend project for you. 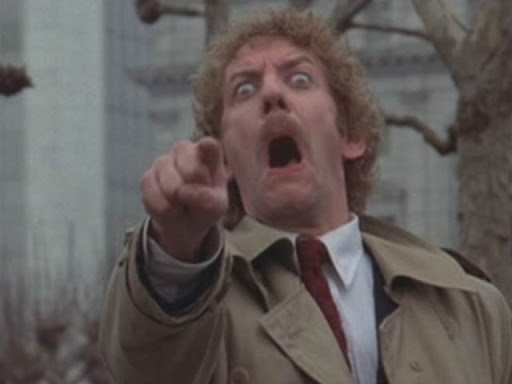 The Donald Sutherland shot is from the 78 remake of Invasion of the Body Snatchers.